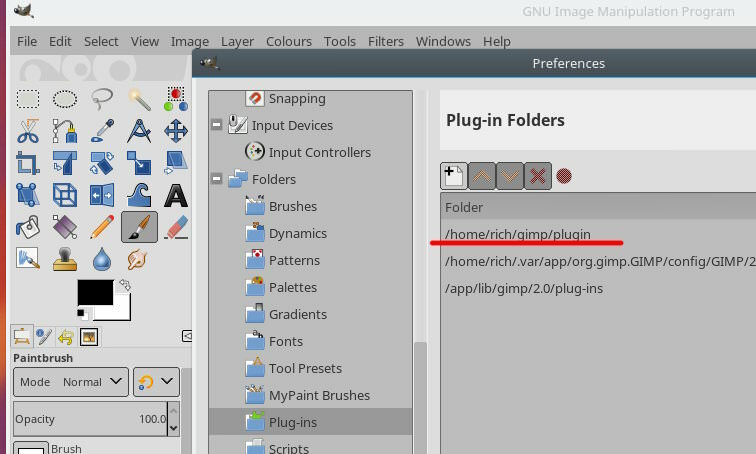 Once that is done, look at https://www.gimp.org/downloads/ for some directions on installing the gimp flatpak. This works, it does ask for confirmations / root password when appropriate. I could not get that to work for me, so used the stanza from it, to make a new launcher. Do not ask me why, but it works. However, Gimp also creates a more regular Gimp profile ~/.config/GIMP/2.10 and seems to prefer that. You will need to add that to the various resources paths. My advice, neither are convenient. 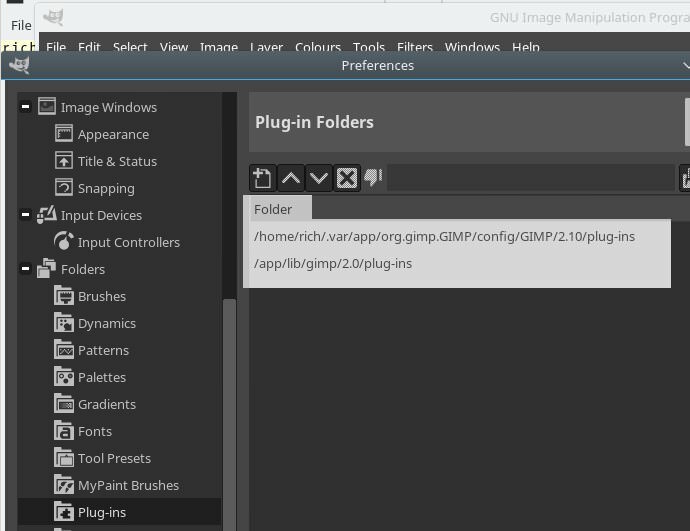 If you mess with Gimp resources a lot, make your own folders somewhere in your home partition and add to the Gimp paths. As this example, changed the theme, icons, added some folders in home. I think many scripts and plugins will work out of the box. I tried resynthesizer and heal selection - all working. As an example, another compiled plugin, guillotine-into-layers then a script grid-of-guides and Ofnuts bend path python plugin. I was disappointed when my FFT plugin failed. That needs libfftw3.so.3 files. Another was the g'mic plugin, not even the QT version but GTK. Did I get gimp-g'mic working? Most of it. If you have tried out the Gimp flatpak, and have any tweaks and hacks, please post a follow up with your experiences. Contains a folder of the library files to go in as per the previous post. and a folder with plugins. Followed your instructions to install 2.10 on my Kubuntu 16.04 and it worked OK. It seems to have reused the profile. Will dig a bit more to see what I can hack to make that work better. Also wondering how I add compiled plugins. Quote: /home/me/.var/app/org.gimp.GIMP/config/GIMP/2.10/plug-ins/fourier: error while loading shared libraries: libfftw3.so.3: cannot open shared object file: No such file or directory. I am aware of that. 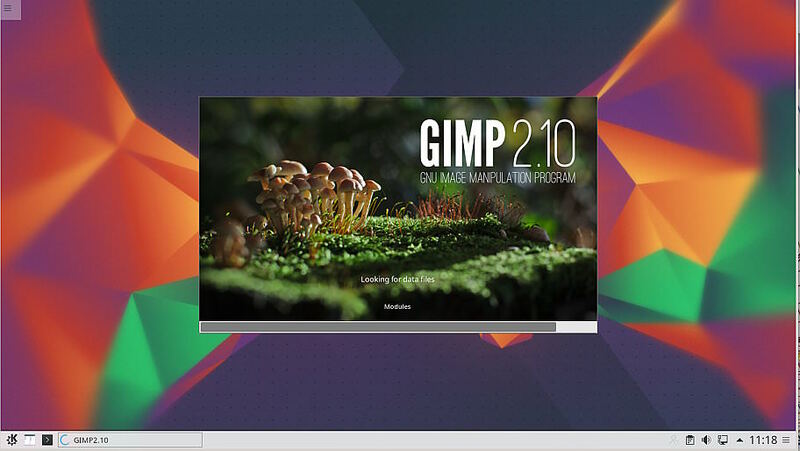 The org.gnome.Platform/x86_64/3.28 runtime is somewhat lacking in support for Gimp. Obviously, none of the lib files I slip into it overwrite existing files. No symbolic links all physical files. It is hopefully a shortcut solution to get Gimp 2.10 into my Kubuntu 16.04 - I do not know your solution. I do run a VM with it installed, but a PITA to fire that up all the time. At the moment, it is a method to extend the life of this Xenial installation. I come from PClinuxOS where for 6 years, updated frequently, but it was still PClinuxOS. No question of reinstalling the whole OS. Really annoyed if I have to reinstall a 'buntu version every six months. (where "inode" is what holds the file data). When you add a hard link that new link is just a new path/name to the data, and has exactly the same status as the initial path/name. You cannot tell afterwards which came first, and if you rm the initial name the data will still be available using the other name. Yes, also a way to extend the life of my 16.04. for me. Rolling releases are fine in some cases, but can also break critical applications. Same as Firefox that updates and invalidates a bunch of plug-ins you depend on. There are people that need stability and this is what the LTS releases are for. In this case I think the Gimp devs have been a bit brutal in their requirement, you can't expect everyone to be on the latest releases. Thanks for showing how to use flatpaks. Never did that before. What I'ld like to know: can you keep your old GIMP Version alongside the flatpak? Or is it deleted? (05-01-2018, 01:29 PM)nelo Wrote: Thanks for showing how to use flatpaks. Never did that before. You do keep everything in your linux installation that you already have. The flatpak is essentially 'sandboxed' runs completely in its own space. Which can be a good thing or can be a disadvantage. You can see from the previous post that while most third-party scripts and plugins will work there are some with missing dependencies. Example: I can use my wireless printer to print. The xsane plugin does not work, so I can not scan. 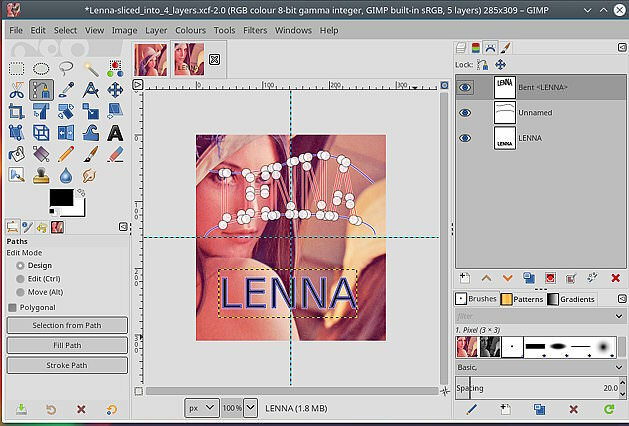 If you want to use Gimp 2.10 and keep your Gimp 2.8 it is worth a try. I'ld like to keep my 2.8.x GIMP as long as I'm not sure what works and what not in the 2.10 version. Though the file is clearly there. Any suggestions? I'd also like to get RAW import working, but GIMP isn't finding darktable or rawtherapee. Got it working--I had put the files in the 'lib' directory for the application, instead of the runtime.